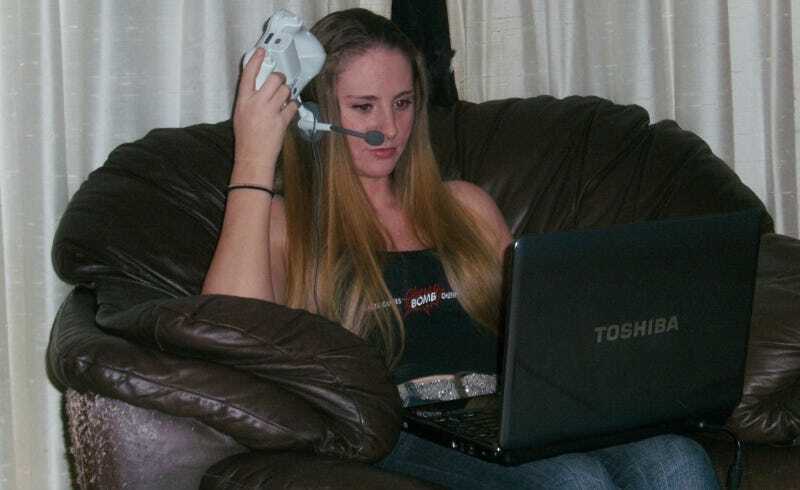 Last year, we profiled Kristen, the stay-at-home mom whose 165,000 Gamerscore made her the No. 5 female worldwide. She set 200,000 as a retirement mark. Monday, she reached it. Does she still plan to put the controller down? "I do but I don't want to," Kristen told me yesterday. "I've been gaming for so long, I'll never quit - I'll probably keep gaming until I'm 70. But as far as achievements, I plan to cut back a lot now." Kristen's achievement-hunting compulsion led her to buy foreign consoles, foreign games, and some of the worst shovelware ever released, just to plunder it for the Gamerscore. When Kotaku profiled her, there was a sense that what she was doing wasn't even fun, though Kristen did take tremendous satisfaction in racking up a six-figure Gamerscore. She plans to return her focus to playing for fun, letting the achievements fall where they may. "I'm not going to sit there for hours on end like I did with Call of Duty 3, playing for 60 hours to get the general rank," said Kristen, who went over 200,000 with "The Vigil," a 20 Gamerscore achievement in Guitar Hero: Warriors of Rock. "I like music games; I do think they're fun," she said, which is why she went out with that one. She traded in six old games to get it a couple of weeks ago. Kristen had been a part of an ultra-Gamerscore collective that swapped around easy-to-beat games or foreign versions of hits like BioShock. Once she finishes off two easy Japanese games and sends them along to the next person on the list, she'll be largely done with the "boosting" culture, Kristen said. "If it's a quick jump-in to a game, 'Hey, help me out,' I don't have a problem with it." The long sessions that took her into the early morning wondering why she was playing a game will be no more, though. Kristen points out that it took nearly a year to cover the final 35,000 of Gamerscore on the way to her 200,000 goal. She was able to get her first 100,000 in less than a year. It means, Kristen says, that she's slowed down her gaming even before hitting her so-called retirement goal. Five months ago, she and her husband bought their first home, she said, and moving into that has taken plenty of time and work. She was taken aback by the commenter reaction to last year's profile, though, especially the extreme judgmental reaction that her Gamerscore alone is proof she's an addicted gamer or, worse, a bad mother. "I think it opened my eyes, really, that gaming, mostly, and pursuing achievements is still not accepted for a female," Kristen said matter-of-factly. "People don't know me, or my lifestyle, or my family, where we're comfortable with [her husband] having a job only," Kristen said. As for the talk of games addiction, "No; it wasn't like there was an eye-opener, 'oh my gosh, am I playing too much?' No. The house is clean, dinner is on the table, my daughter is fine, and I don't get yelled at for playing video games. Too much." Her plans now involve Kinect, which she's looking forward to as a game to play with her family; Call of Duty: Black Ops and, curiously, Gran Turismo 5, whose endless delay may have been partly responsible for her Gamerscore getting this high. "I love Gran Turismo, it's why I bought a PlayStation 3 [back in 2008]," Kristen says. "When that comes out, I'll definitely be spending a lot of time with it." But silly games like Spongebob, Cloudy With a Chance of Meatballs, and Japanese visual novels are over. "I wanted to get to 200,000, so I started playing some cheesy kid games," Kristen said. "Now that I've hit it, I can't wait to just play Black Ops."